This is not sponsored content. I own and/or personally recommend all of these items. 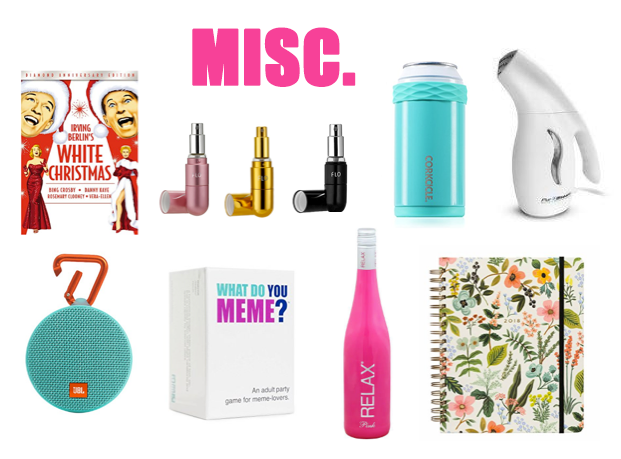 The best Christmas movie of all time, the fragrance atomizer I use for traveling, an Arctican to keep beverages cold, the travel steamer that works well enough to use at home too, a cute portable speaker, a fun new game we are totally getting, the prettiest pink bottle for an easy hostess gift, and a 2018 planner for your Type A friends! The best accessory (statement earrings) + the invention that makes them work for anyone - BlingGuard Bling Dots! These magic little discs give your ears a "lift" making even the most heavy earrings possible for anyone to wear. The ultimate stocking stuffer for your fashion-loving friends! Take a break from holiday shopping for a sec to think about your own needs - your denim needs, that is. 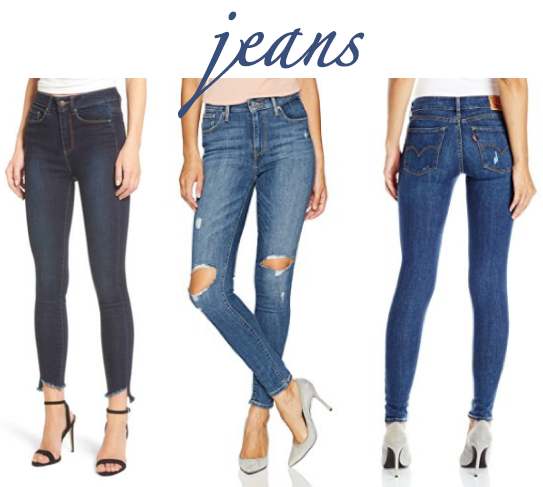 Nothing is more important in your closet than a good pair of jeans. These three are my current go-tos. From left to right - for a night out, for every single day, and for really casual days. LOVE them all. The most perfect cotton t-shirt, it comes in 10 colors, and it's only $18. Plus more great fair trade gift ideas from a few of my favorites - Everlane, Noonday, Elegantees, Reformation and Deux Mains! I own all of these accessories, highly recommend and will be wearing them on the reg this holiday season! They make a great gift - for Santa to put under the tree for you, or for your bestie or sister. 1. Required reading for anyone with a creative hobby or career. 2. This coffee table book looks so dreamy. 3. This memoir written by young, dying neurosurgeon is so powerful, I can't recommend it enough. 4. The best, sweetest novel of all time. I've read it too many times to count! 5. A fascinating read about the introverts and extroverts among us and what makes them tick. 6. I waited way too long to read this classic. It's such a treasure. 7. A deeper exploration of the clothes we wear and why beauty is at the center of a woman's heart. Deck your holiday self (or that of your BFF) with the prettiest sleeves. I have #1, 3 and 4 (see blog posts here and here). Loving this trend for the holidays... and as a classic forever. For more recommendations, Oprah's drool-worthy gift guide is pretty fabulous. I would love to hear your recommendations, too. I've got all my shopping left to do, so please help a sister out!